Health Data Vision, Inc. welcomes you to episode 4 of The Value-Based Healthcare Podcast. 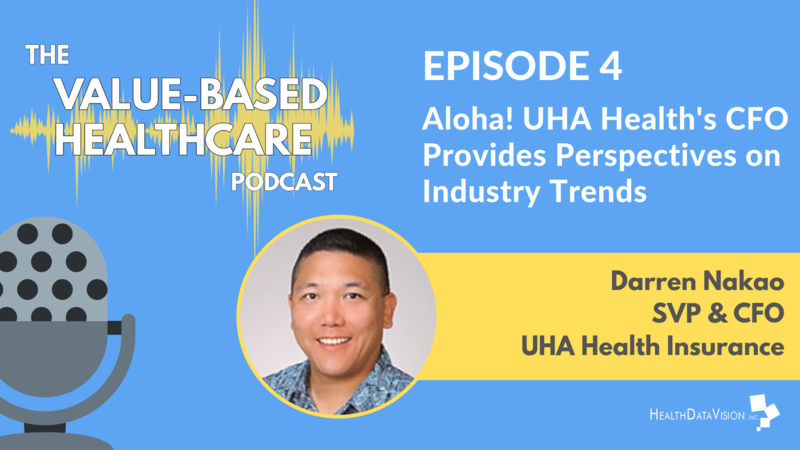 Our guest on this episode is Darren Nakao, Senior Vice President & Chief Financial Officer at UHA Health Insurance. This series aims to assist health plans become more successful through shared experience and best practices used by their peers in the industry. We interview executives at all levels within Risk Adjustment and Quality Improvement groups to share various perspectives. The Value-Based Healthcare Podcast is about sharing inspiring and real-world solutions from the people who are questioning the way business has always been done. We aim to educate across the spectrum of healthcare so that managed care organizations, providers and members alike are more successful in navigating and operating in this complex and ever-changing landscape. Subscribe today to ensure you receive the latest episodes! Hello and good day. This is Jay Ackerman and I'm the CEO of Health Data Vision. We’re a software and services business committed to providing health plans with innovative technologies to maximize their return from HEDIS, risk adjustment and compliance initiatives. This is a must in the value-based care world we operate in. We're back with our ‘Succeeding in a Value-Based Reimbursement World’ podcast series. Through our podcast we aim to widen the visibility and voice of people shaping significant functions inside of health plans. And I'm thrilled today to be joined by Darren Nakao, CFO for University Health Alliance. Please enjoy this podcast and feel free to share it with others and promote via social media. Now, for a little about our guest. Darren has been with UHA since 2014. He is the Senior Vice President and CFO responsible for fiscal underwriting in provider contracting functions. Darren grew up on Oahu, in a town called Waipahu. When not at UHA, Darren can often be found cheering on his son and daughters on the side of a soccer field. This is a family passion that has taken him and his family to Los Angeles, San Diego, Phoenix, Denver and even as far away as Tokyo. So now with that, let's hear from Darren. Darren, good afternoon. Let's begin with a few questions regarding your career journey. Can you share how you found your way into healthcare? Sure. Jay, thanks for having me on. I graduated from Brown University with a degree in mathematical economics and I actually wasn't really sure what I wanted to do coming out of college. I thought, perhaps I would work at a financial services company, like a bank or insurance company, and I ended up landing my first job at the local Blue Cross Blue Shield organization in Hawaii. There, one of the projects I got to work on was a project to redesign the entire sales pricing and enrollment process. And out of that I landed my first management job of overseeing the enrollment department. Then I left to get a technology company that was building a medical billing startup. There I gained some hands-on experience with budgeting and accounting. And as the company grew organically through sales as well as through acquisitions, I got my first position there as CFO. I then left for a couple years, I had a sort of a nontraditional path. I left and I went to go teach high school, science and math for a couple years.It was just something that I was passionate about. And then as my wife and I were about to start a family, I went back into the business world, to my previous CFO position. And then I circled back to work at the Blue Cross Blue Shield organization, doing their finance for one of their subsidiaries. And then as they had sold off that part of the subsidiary, I got a position in the provider services and contracting department there as well. And then that was my last job before I finally got my table position at University Health Alliance where I now oversee underwriting, provider services and contracting, as well as the finance and accounting department. So, my career came full circle that way. So, what was it that drew you to you University Health Alliance? Well, the focus on the wellness culture. I had seen a lot of their ads on TV that promoted how their employees like to exercise at work. Actually, I found when I got employed there, that that’s actually true. Where you see people in the hallways doing wall squats, or sitting on ball chairs, or we had a jump rope contest here. We had a burpee contest on the breaks. I found that that initial wellness culture, is something that drew me to here to this day. Plus, the opportunity to be a senior leader in a growing organization. So, the jump rope or the burpee, which one will we see you on the top of the leaderboard? Oh, I would say… neither actually (laughs). But I tried my best at both. When we had a burpee contest here to support March of Dimes, I ended up in the featured section of the local newspaper. I guess I was photogenic enough in by burpees (laughs). That's great. Well, all kidding aside, how is it that you’ve become responsible for overseeing the health plans’ initial validation audit of the ACA exchange? Yeah, so we only do commercial business here so, we didn't have any expertise on Medicare Risk Adjustment or anything like that. So, it basically fit best in my area since it has a financial impact. Especially with the impact to underwriting and pricing and we need to partner with the providers to get a good return on the number of charts that we're auditing. So, each of the areas that I oversee has a part in this effort. Can you share what your goals are related to the initial validation audit? Yeah, we actually have a PPO network. We have a high participation rate in the network and we basically share the network with the other PPO providers in town. So, making sure that we can do at least as well as everybody else in terms of chart retrieval and getting validated codes. That would be success to me. And doing it in a way that is as low-intrusive to the providers as possible. That's great. Thanks for sharing that. So, let's talk a little bit about the industry and some of the change that's unfolding. What industry trends do you see that are beneficial to you and UHA? I think the trend to giving states more autonomy and developing requirements for the market is a good thing for us. In Hawaii we are already in a market with a high rate of insured lives, especially in the group market. Hawaii had a prepaid healthcare loss in 1974. And so, we were already in a mature market with rich coverage, high rate of insured and so, many of the ACA premium stabilization programs that were put in place to help with new entrance into the market didn't really apply so much in Hawaii, especially in the group market because of high participation rate. So, having a regulatory environment, I think that's more in tune with local issues and local market forces is better for our industry as opposed to federal solution that more one size fits all. So, I can see how that benefits the industry in total. What do you see as trends that are impacting you in particular? So, I think to the degree that we can; our state is applying for ACA waivers in certain areas and so, we're keeping track of what's going on at that level and making sure that we're keeping a level playing field for us to compete. There's probably a lot more focus on the individual market because that's a market where more new entrance, you know, in terms of covered lives came into the market that were previously uninsured. That's not a market that we participate in. But we do pay attention to how one market affects the other market. So, let's say it's a reinsurance program that the state wants to put in place to help with high-cost individually covered lives. We want to understand how that's going to be financed. Whether or not that is going to be something that all insurers are being asked to put in for. Or as it was with original design of the ACA reinsurance program or if it's going to be either taxed or funded some other way. What are the greatest barriers or challenges that you see affecting your success in this environment? So, I would say the dual compliance with ACA and state regulations. It's been a big challenge for us. I think, as benefits became highly regulated and now pricing, especially in the small group market where everything's age-based pricing. There aren't many other ways to differentiate yourselves in the market. Basically, everything looks like it's the same benefits of the same price, especially in our market. So, with all the insurance product looking the same, we're looking for other ways to differentiate ourselves in terms of service, brand recognition, ease of doing business with us in terms of being able to electronically enroll or do things via the mobile app. Darren, thanks for sharing that. So, what is your team doing to address some of those challenges that you just shared? We're looking at different ways to make (this isn't necessarily my area) but make things administratively easier for employers to purchase coverage from us. So, it may be looking at technology to allow lawyers to get quotes from us and submit their enrollment online. We also think we have the best relationship with the providers in our market. UHA was founded by a physician looking for a better way to do business and trust doctors to do the right things and keep things as administratively streamlined for them as well. So, we've been doing a lot of online transactions with prior auths. But for example, our prior authorization requirements are very targeted to certain areas where we feel that there are actual issues and try not to do one size fits all type of prioritization. That’s super. Thanks for sharing that. And I think from our engagement with your providers, it does seem that there seems to be a strong tie between your plan and providers. But let’s kind of turn the dialogue a little bit, kind of internal. When meeting with Howard Lee, your CEO, what might you tell him about your business goals and priorities with respect to the initial validation audit? I think first of all, I'd like to be able to say that we're going to be able to get everything done on time, done well, and done on budget. But also, we're looking to see how we can improve upon the process from year to year. Take any learnings that we can get from the initial validation audit and apply them. Other things that we're working on like chart retrievals; to make sure that we are making the best use of our resources, targeting the right areas, whether or not a certain disease states that we're having trouble validating or certain provider groups that we’re having trouble, either more success or trouble, getting the information from. Finding areas to target so that we can keep improving. So, kind of just continuing on with a similar question is; - what request my you make of the CEO or peers on your team to help you with some of the initiatives or objectives you just shared? Mostly I feel like I want to make sure that the leadership team is informed about risk adjustment and how to fix their business financially and operationally. How it affects the provider community because we need this further communicated to our board of directors and other stakeholders as executives are out in the community, talking to provider groups or hospital executives. We want to make sure everyone is on board and that we can articulate why these initiatives are important. And working with our company, HDVI, can you share how our partnership is helping you achieve success? Sure. We're obviously relying on the experience of HDVI to complete the IVA with as little stress on our own resources internally, operationally. So, we really rely on HDVI to project manage their resources, their tasks that need to be done. Our people obviously play dual roles in our organization. They're working on the risk adjustment project, but they also have sort of their operational day-to-day things. So, if they are being as efficient as possible with this project, I think that'll go a long way. And we feel like we're getting a high level of service from HDVI in this area. We're also aware that the chart pulls are disruptive to the providers’ practice so it's important for us to work with a vendor like HDVI that is sensitive to the provider abrasion and tries to be as non-intrusive while still getting the results. Thanks, Darren. So, in this environment and if you think about other partnerships; - what characteristics do you value when considering a business partner? We look for things that normally might come to mind like experience, reputation, whether the services are designed to meet our needs. But as much as possible, we try to meet the senior management of any vendor that we're working with and hear directly from them to see if our business values are aligned. And we also like to speak directly with individuals that would be servicing our business partners as extensions of UHA. So, we'd like to ask ourselves if we were to make the same judgment of offering, bringing a vendor on as if we were bringing on that person on as an employee. Would we see ourselves hiring those individuals into our company? Would that be a similar kind of match? And so, I appreciate the ability to talk directly to you as HDVI’s President, and also, you guys have made available, in advance, the staff that we would work with so that we could talk to them as well. Thanks for sharing that. I mean, I know we went through that on the front end and I think it actually gives me better context as to why that was important to you. Hey Darren, I really enjoyed our conversation today and it's been helpful to provide some insight into your career, some of the choices you've made, and also about your health plan in the marketplace, and what you see unfolding. Thanks for taking time, I'm sure your schedule is quite busy as you wrap up initial validation audit and embark on a new calendar year. I'd love it if you would indulge me in five lightning round questions. We’ll move through these quick and if you wouldn’t mind, to share what's top of mind for you. What keeps you up at night? Basically, staying competitive in our market, but also the escalating cost of treatment. A few years ago, when the hepatitis C drugs came out at the high price point, there wasn't enough premium dollars to cover that kind of shot. And so, the initial shock is borne by the insurance companies, but eventually it gets passed on to the customers in the form of higher premiums. But just because the market ends up correcting doesn't mean it is affordable for the average business to take that increase on. So those are some of the things that keep me up. Yeah. So, when awake, I’m stewing over questions like that or issues like that. What book might you grab from your nightstand and maybe you can share why you're reading it? You know, I'm not much of a reader at night. I try to just kind of redirect my thoughts to maybe more something introspective like how I’m doing as a leader, or as family person, as a dad. But the book that is on my nightstand right now is called The Shoal of Time.It's actually the history of Hawaii. And growing up I felt I never really appreciated history as a subject area and I find that, more and more that you can understand a lot about what's going on today in terms of economics, politics or history by reading some history. So, for example, the culture of rich health insurance coverage in Hawaii has its roots in our history of sugar and pineapple plantations providing healthcare for their workers. So that's an example where history can inform you. Fascinating. Staying light, what's the favorite app on your mobile device? Yeah, I grew up playing baseball so the MLB app. Especially during the season. I'm always getting alerts and checking it (laughs). Yeah, that one since on my phone as well. So, getting a little bit heavier here. If you could redo one decision in your life, what would it be and maybe you can share why? Gosh, not really a decision, per se. We did get a lot of college counseling growing up, you know, in high school in terms of where to go to college. But I wish I had done a little more research on career counseling or getting more educated on the different types of careers that were out there and what they were like. I maybe grew up by naively thinking that every doctor was a pediatrician and every attorney was a litigator but I have since come to realize that there's all kinds of doctors, all kinds of lawyers, all kinds of engineers and all kinds of people that do economics. And so, I think just having that broader view of, you know, what kind of things different people do out there and having a better sense of what might have been interesting to me. But I’m very happy with the way things worked out even though I had to do different things to get to where I got to. Well, you’re clearly fairly introspective so maybe stay on that. How do you invest in yourself? I do some running to clear my mind. But while I run, I podcast, I listen to a lot of economics and the personal finance podcast and I find that it gives me a lot of ideas about what I can do for myself, personally. But also, I think a lot of personal finance ideas can be applied in corporate world to and vice versa. And so, taking some micro ideas and turning them into bigger ideas that I can use to do finances for this company and vice versa. Sometimes I take things that I learned in the corporate world and try to apply them in my personal life. Perfect. Yeah, that's great. Well Darren, you’ve been great. Thanks again for your time and your openness. You shared a lot with us, so thank you. This brings our ‘Succeeding in a Value-Based Reimbursement World’ podcast to a close. Please follow Health Data Vision on Facebook, Twitter and LinkedIn. and you may also follow me on Twitter @AckermanJay.